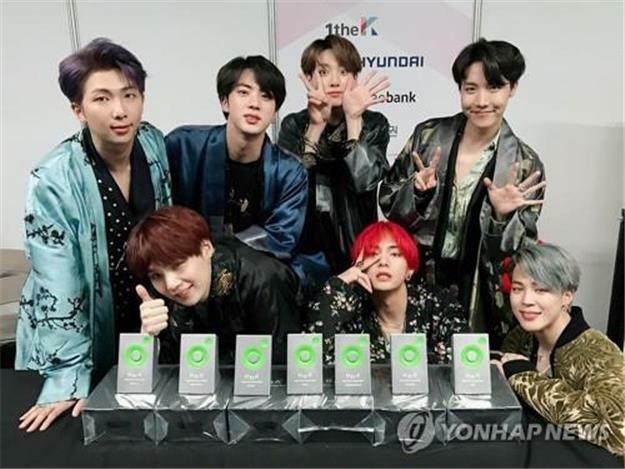 SEOUL, Dec. 7 (Yonhap) — K-pop boy band BTS made business news service Bloomberg’s annual list of the 50 most noteworthy accomplishers, its website said Friday. The news provider described its annual Bloomberg 50 as “our look at the people in business, entertainment, finance, politics, and technology and science whose 2018 accomplishments were particularly noteworthy,” unveiling the list on its website. BTS were the only Koreans listed on the chart, which featured highly accomplished government or business figures, such as Ben van Beurden, the CEO of Royal Dutch Shell, and Jerome Powell, the chair of the Federal Reserve, and his Fed colleagues. American singer Taylor Swift was one of those selected for the entertainment field, along with BTS. “Tickets for its first worldwide stadium tour sold out in minutes, another sign that audiences are ready for bands with Korean sensibilities,” according to Bloomberg.